A poster on a humble forum for learning Japanese called Japanese-online.com had a question dating from late June about how to turn an ichidan verb (like taberu, “to eat”) into a potential (can do) verb instead of a passive (done unto you) verb. Here is my response, slightly modified. The poster had a computer issue where he could not read kana and kanji at the moment, so I have added these for ease of reading for advanced learners. Basically, adding “reru” to the stem of “taberu” (which would be “tabe”) is wrong because “reru” is accounted for; it’s the imperfective form of godan verbs and “sa” type irregular verbs. For ichidan verbs, it’s “rareru” for BOTH the potential, can do verb tense, AND the passive, done unto someone verb tense. I mean, that’s just the way it is. You make taberu into a can do verb by turning it into taberareru. That’s the pattern with all ichidan verbs. I’m sorry, I know you were looking for a way to do this that would be separate from the passive taberareru, but it doesn’t exist. They’re both pronounced and said the same. That’s why context is king when dealing with this kind of thing. Actually, this is MUCH easier to demonstrate using a negative. This does not mean, “The hamburger cannot eat me.” The hamburger is the direct object of the verb. The verb is committed by the topic/ subject, who is “watashi” (“I/ me”). The problem with reading this as a passive verb is the “o” particle. Here, “o” clearly indicates that the hamburger is the direct object. This means that taberaremasen cannot be the negative of the passive tense. So, it must be the negative of the potential tense. Rather than can do, “watashi” can not. Let’s try a different formulation. In this case, the “ni,” which in this case, indicates that “hamburger” is the indirect object of the verb, makes all the difference. So, as you can see, the particle makes a huge difference in how the verb can be read. It’s a simple matter of process of elimination. Once you have a firm grasp of direct and indirect objects, it’s much harder to confuse these two verb tenses. As a final note, Japanese children will often incorrectly use “reru” instead of “rareru.” They’re kids, not educated adults. Let’s not hold it against them. But little kids don’t talk like that. They take the grammatically incorrect shortcut. Good to know. Not good to copy, unless you’re impersonating a little kid (and are cute enough to get away with it). 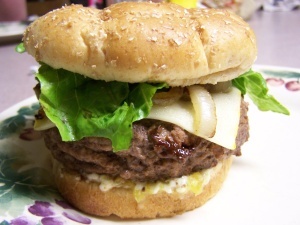 This entry was posted in Grammar, Japanese and tagged Grammar, hamburger, ichidan, Japanese, passive, potential, verbs. Bookmark the permalink.